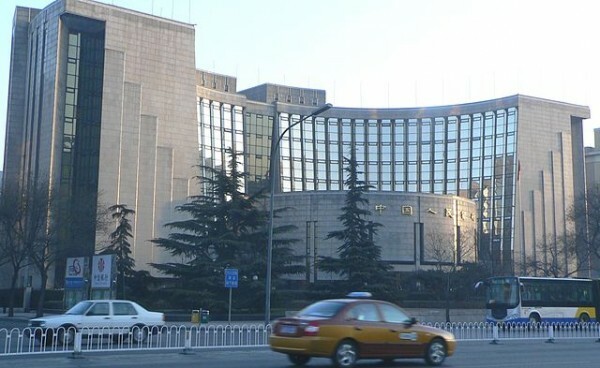 In mid-January, the People’s Bank of China (PBoC) announced that its foreign exchange reserves had grown by a breathtaking $157 billion in the fourth quarter of 2013. That influx of reserves brought annual growth for 2013 to $508 billion (the largest calendar-year increase ever) and pushed the total amount of China’s reserves toward the $4 trillion mark. To put this figure in context, the U.S. spent roughly the same amount, $3.8 trillion, on all of its operations in the last fiscal year. Other countries’ concerns with China’s foreign exchange holdings have grown in step with those reserves. Both established trading partners in the developed world and potential trade competitors in emerging markets have voiced worries about the impact of China’s reserves on the value of their own currencies and the competitiveness of their economies. So as China’s leaders work to rebalance their economy primarily for domestic reasons, the methods they employ also have important foreign policy implications. To better understand those implications and the macroeconomic “mechanics” involved in China’s burgeoning foreign exchange holdings, I recently interviewed Kent Troutman, a research analyst at the Peterson Institute for International Economics in Washington, D.C. A former Fulbright Research Scholar who spent a year in China studying the political and economic relationship between China and North Korea, Troutman is a regular contributor to the China Economic Watch, a blog that follows developments in the Chinese economy. The views he expresses below are his own, and not necessarily those of the Peterson Institute of International Economics. 1. To start at the very start, how do foreign exchange reserves accumulate, how do China’s reserves compare with those of other countries, and why are China’s reserves so large? Official foreign reserves accumulate as a result of government policies that counteract natural market forces. For example, oil producers such as Norway take a portion of their oil revenues and put them in a managed reserve fund. Other countries, such as China or Switzerland, intervene directly in the foreign exchange market. The simple mechanics of the latter look like this: foreign currency flows into a country via investment or trade flows. The more foreign currency there is floating around in an economy, the lower the price of that foreign currency relative to the domestic currency will be. To offset those appreciation pressures on their own currency, officials intervene in the market, buying up the foreign currency and supplying domestic currency, thus cancelling out the normal market equilibrium. China’s foreign currency reserves are quite large (see chart) and still growing at a remarkable rate. 2. Sitting on a large pile of cash obviously sounds like a good thing. What are the benefits it confers to a country, and what are the downsides to that country – and to other nations – of its holding such large reserves? There are two primary reasons for a country to accumulate reserves. The first is to protect itself against short-term capital flow volatility. (I include natural resource-related accumulation in this category.) The second is to preserve the competitiveness of its own currency during a financial crisis. Many emerging economies experienced (sometimes more than once) devastating financial crises that were sparked by, at base, an over-dependence or unbalanced dependence on foreign capital. Since these crises, many emerging markets, such as South Korea and Chile, built up a buffer of foreign currency reserves that allowed them to weather adverse changes in international capital flows. If a country does not have such reserves and its corporations, banks, and individuals suddenly experience a scarcity of the foreign currency they need to fund their ongoing operations or to service outstanding debt, they will be willing to give up more and more domestic currency to acquire the foreign currency. This leads to classic a “bank run” situation. The value of the domestic currency drops rapidly, while the price of imported goods and external hard-currency debt increases. We saw this occur this past May and June in countries such as India and Indonesia after the Fed intimated that it might “taper” its QE3 program. It also matters whether a country is a net importer or net exporter. The primary downside for a country holding foreign reserves is the cost. China, for example, holds a large stock of low-yielding U.S. Treasury securities, while the liabilities that it issues in exchange have much higher yields, resulting in what is called a negative carry trade (the interest you pay is greater than the interest you receive). While a few percentage points may not sound like much, on a stock of nearly $4 trillion, it certainly is. Another related cost is that you are exposed to the policies and performance of a foreign country, which has its own interests in mind – interests that at times may be antithetical to those of the creditor. The downsides to other countries of a nation accumulating reserves primarily involve loss of price competitiveness. If China is a large buyer of U.S. dollar assets, then the foreign demand for the dollar will be artificially high and the result is a loss of competitiveness for U.S. businesses. Similarly, if Brazil does not likewise intervene in its currency, it will be less competitive vis-à-vis China. This can lead to a spiral of competitive devaluations, where many countries institute beggar-thy-neighbor policies to maintain their competitiveness. 3. In the absence of government intervention, such as in a classic free-market economic model, how does a surplus of foreign exchange reserves affect a country’s currency and domestic economy? Well, absent government intervention in some form, official foreign exchange reserves would not exist at all! Rather, the management of foreign reserves would be the province of private companies and banks. Banks would have to independently manage their stocks of foreign exchange to match their liabilities, to ensure that they have enough to withstand a “sudden stop” of capital flows. Unfortunately, many countries’ experience demonstrates that this type of institutional prudence is not exercised. But, say, for the sake of illustration, that banks and corporations managed their FX liabilities and assets prudently; the effect on the domestic currency would be the same. Banks would keep a certain percentage of their liabilities balanced by liquid assets of a safe currency, and that would put incrementally more downward (weakening) pressure on the domestic currency. The natural question is, “How is everyone able to hold prudent amounts of FX (which principally are U.S. dollars)?” The answer is that the U.S. must be a deficit country in order to supply the world with enough dollars to meet the demand. This is one of the costs to the U.S. of issuing the world’s reserve currency and of having other countries stock-piling its currency (for more on this so-called “exorbitant privilege” dilemma, see works by Eichengreen or Frankel). 4. What steps are the Chinese taking to control the impact their foreign exchange surplus has on their currency and economy? How well are those steps working, and are they sustainable? It seems to have become quite clear to Chinese officials that increasing their stock of foreign reserves is no longer beneficial (for reasons including, but not limited to, those stated above), and they are moving away from this policy of accumulation. I would say that there are two broad approaches they are pursuing to this end. The first is allowing the renminbi (RMB) to appreciate and allowing it to trade more freely on market exchanges. It currently is in a strictly managed float, in which officials set the official rate each day and allow it to fluctuate plus or minus one percent from that rate throughout the trading day. The most likely next step will be a widening of that trading band. The second approach involves movement toward allowing the RMB to be fully convertible. That means the Chinese will need to allow anyone to exchange dollars for RMB, and vice versa, onshore without being subject to limits. The RMB already is “fully” convertible in Hong Kong, and that has resulted in a bifurcated price of the RMB – different onshore and offshore prices, with the latter determined by the market. These measures so far have been successful in that they have, on the margin, helped alleviate the pressure to accumulate foreign reserves (by allowing the RMB to appreciate or allowing foreign investors access to the RMB offshore, there is less need to intervene onshore). But the persistence of reserve accumulation shows very clearly that there is still work to be done. If the current policy of intervention continues, as the Chinese economy grows, pressure to appreciate will occur at ever larger magnitudes, and therefore intervention will have to be equivalently larger, and thus reserves will continue to grow rapidly. 5. What international pressures is China facing in terms of how it manages its foreign exchange reserves? The international pressure comes principally from the U.S., as China’s holdings are largely made up of U.S. assets. But as China has sought to diversify its holdings into other currencies, it has encountered objections from other countries, including Japan. The effects of China buying Japanese assets pushes up the Japanese yen, which is counter to many efforts that officials in Japan have made to depreciate their currency. China faces challenges in moving to diversify its holdings outside the U.S.; when it moves into smaller markets, it will have outsized effects, given the enormity of its stock. Pressure also has come from other emerging markets, such as Brazil, who have complained that China’s intervention was causing them to lose competiveness and who have threatened to intervene to support their own currencies. This raised alarms about so-called currency wars over the last few years. 6. As best we know, what is the composition of China’s foreign exchange reserves, and how does the current composition compare to historical trends? What is the significance of any recent changes in the composition of its reserves? 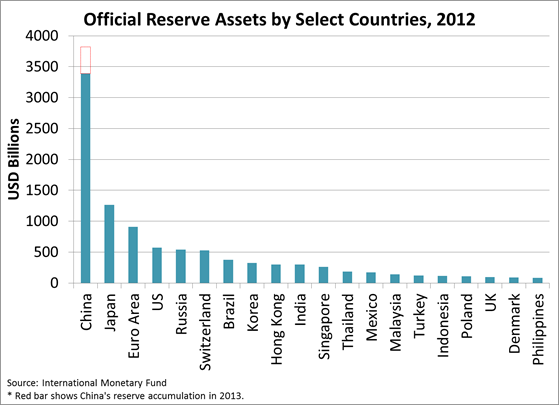 China does not disclose the composition of its reserves. However, by looking at what individual countries report, one can get a picture of broad trends in its allocation. Since 2010, China appears to have been diversifying its holdings away from U.S. dollars. But, as I mentioned earlier, that is quite difficult. There are principally three considerations for how a government allocates its foreign currency reserves: 1) safety, 2) liquidity, 3) return. The primacy of the first two considerations leaves the U.S. as really the sole market that can absorb the enormous demand from China’s reserves. Therefore, China is trying to a) decrease its accumulation, and b) diversify where it can into assets in other currencies. 7. In recent years, there has been anxiety voiced in the American press and among the general public about the amount of U.S. government debt held by the Chinese. Can you provide some context around this issue? How much leverage does this give Beijing? How will the Fed’s plans to taper its “quantitative easing” bond-buying program likely affect this situation? While the Chinese government is, indeed, the largest foreign holder of U.S. debt, it is not the largest holder. The largest amount of U.S. debt is held domestically. I believe its holdings give China the ear of U.S. officials, but that does not mean that U.S. officials do the bidding of the People’s Bank of China (PBoC), and most certainly they have not done so in the past. There is a well-documented co-dependent relationship between the U.S. and China in regards to this matter: The U.S. enjoys lower rates on its borrowing due to China’s demand, and China gets liquidity and safety for its reserves. But this relationship has started to sour, and it increasingly is viewed unfavorably by both sides. But for this co-dependence to change, or at least be diminished, both sides will need to give up the benefits that this arrangement provides. China will need to allow the RMB to appreciate and will need to rebalance its economy, which can be a painful process. The U.S. will have to pay higher rates on its debt, and imports will be more expensive due to a weaker U.S. dollar. The balance of the benefits and costs is quite complicated, and really depends on the speed and intensity of the unwinding of this forced financial embrace. The effects on China of the end of the Fed’s QE3 program will be mixed. On the one hand, a stronger dollar hurts its exports (as long as the RMB is managed to the dollar). On the other hand, the fact that the Fed will taper only if the U.S. economy is strong means that demand from the U.S. (and other recovering developed countries) for China’s goods should increase. Again, the net effect of these forces really depends on their relative speed and intensity, and on how China reacts. 8. Finally, what do you see the balance of 2014 holding for the level and composition of China’s foreign exchange reserves and their impact on the domestic Chinese economy and international economy? 2014 will be a really important year — what year isn’t? With new leaders in China one year into their terms, and with their promise to rebalance the economy, the momentum seems to be on the side of China reforming its financial system. Should they allow the RMB to appreciate or to be further marketized, and push forward with other planned reforms to the financial system, this should result in an incremental shift away from reliance on investment and toward consumption as a driver of growth. In terms of the international economy, the composition of demand within China may change with this rebalancing, away from raw materials and natural resources to consumer products and services, which could be beneficial to countries exporting to China. If reforms are not delivered, however, we will most likely see more of the same: more reserves and further domestic and international imbalances. Tom Garry is an analyst and writer who examines how capital flows affect everything from the stability of Euro-zone governments to the basic needs of families in developing nations, and from the bankrolling of terrorist organizations to the redistribution of power in our multi-polar world. He has a master’s degree in financial economics from the University of London’s School of Oriental and African Studies, where his thesis focused on the exchange-rate policies of Latin American countries, and a master’s in political science from American Military University, where his thesis examined resurgent Russian influence in the Eastern European nations of the former Soviet Union. He received his bachelor’s degree in international relations from American Military University. When he’s not “following the money,” Tom’s other areas of focus extend from business marketing and consumers’ financial decision-making to religion, governance, and diplomacy.